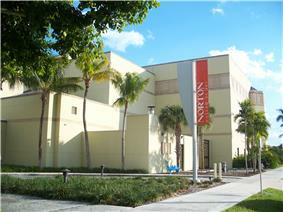 The Norton Museum of Art is an art museum located in West Palm Beach, Florida. Its collection includes over 7,000 works, with a concentration in European, American, and Chinese art as well as in contemporary art and photography. In 2003, it overtook the John and Mable Ringling Museum of Art, in Sarasota, as the largest museum in Florida. The Norton Museum of Art was founded in 1941 by Ralph Hubbard Norton (1875–1953) and his first wife, Elizabeth Calhoun Norton (1881–1947). Norton, the former head of the Chicago-based Acme Steel Co., moved to West Palm Beach upon retirement and decided to share his sizable collection of paintings and sculpture. The late Art Deco/Neoclassical building designed by Marion Sims Wyeth opened its doors to the public on February 8, 1941. Its mission statement is "to preserve for the future the beautiful things of the past." In 2001, the Norton Museum of Art underwent a significant expansion when the 45,000-square-foot (4,200 m2) Gail and Melvin Nessel Wing was built and increased the size of the museum to 122,500 square feet (11,380 m2). Constructed over two years, it was opened to the public in 2003. The expansion created more space to display art in both the new and existing areas, increasing the Norton's gallery space by 75 percent, allowing more opportunities for the museum's permanent collection. The wing includes 14 new galleries, an enclosed courtyard to accommodate a variety of educational and social events, a glass ceiling installation commissioned from Dale Chihuly, a cantilevered spiral staircase, and three-story atrium designed to evoke the museum's art. The J. Ira and Nicki Harris Family Pavilion is a wedge-shaped meeting and reception space off to one side. The new wing was designed by Chad Floyd of the Connecticut-based Centerbrook Architects. In 2013, the museum unveiled a new master plan designed by the British architect Norman Foster that would nearly double its gallery space and add an education center, auditorium and restaurant. The ground-level galleries showcase contemporary American art. The top floor is given over to European art through 1870. During her tenure as director between 1990 and 2009, Christina Orr-Cahall transformed the museum into a full-fledged cultural institution, more than quadrupling its size. Hope Alswang has been director of the museum since 2010. ^ Matthew Gurewitsch (April 17, 2003), A New Wing For the Norton Museum Wall Street Journal. ^ Robin Pogrebin (December 4, 2013), A New Plan for Norton Museum of Art From Norman Foster New York Times. ^ Carol Kino (March 14, 2012), Meet the New Boss, in the Shadow of the Old Boss New York Times.